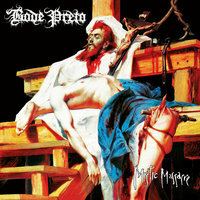 Bode Preto are a Brazilian band who do a brilliant job of invoking their country’s extreme metal history. They have ties to scene legends like Sarcofago and Holocausto, and the album cover is violently insulting towards their country’s Catholicism in a nice, retro kind of way. The music here is super-fast blackened thrash, with absolutely no fat on the bones whatsoever. Unquestionably worth hearing. Ltd. to 400 copies on black vinyl.